Preheat oven to 400 degrees F. Cut yams into wedges, approximately 8-10 per yam. Toss yam wedges in a bowl with olive oil and salt. Line a sheet pan with foil and lay the wedges on the sheet pan. Cook for approximately 20-30 minutes. 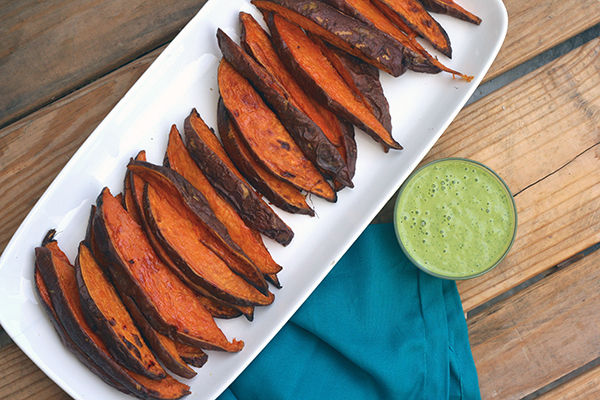 While yam wedges are cooking, blender combine all the sauce ingredients in a blender. Blend until smooth. Serve with yam wedges. First prepare the dressing. Whisk together a pinch of salt, garlic, vinegar, and mustard. Slowly incorporate olive oil while whisking. Add julienned basil leaves and taste. Add more salt and pepper as needed. Boil a pot of salted water for blanching. When the water comes to a rolling boil, drop the broccolini in until it turns bright green, less than a minute. Remove the broccolini from water and set aside. Place bell pepper directly over an open flame. Roast the exterior of the bell pepper. Once completely blackened, remove from heat and allow the pepper to cool. Once cooled, peel the skin and small chop the flesh of the bell pepper. 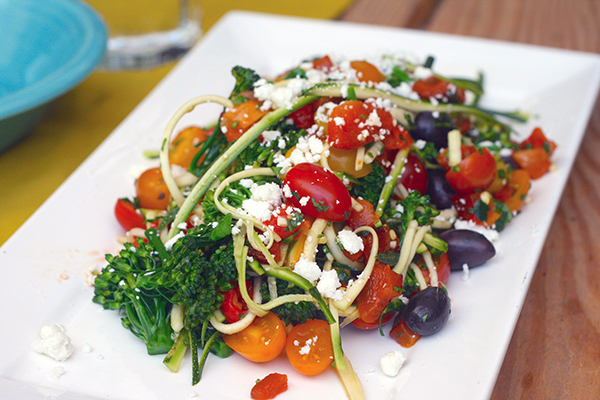 Now place all of your salad items except for the feta in a large bowl and toss with the balsamic dressing. Plate dressed salad and crumble feta on top. Cook soba noodles as directed. Run under cool water and set aside. Whisk together tahini, ginger, rice wine vinegar, tamari, oils, lime juice and garlic to create dressing. 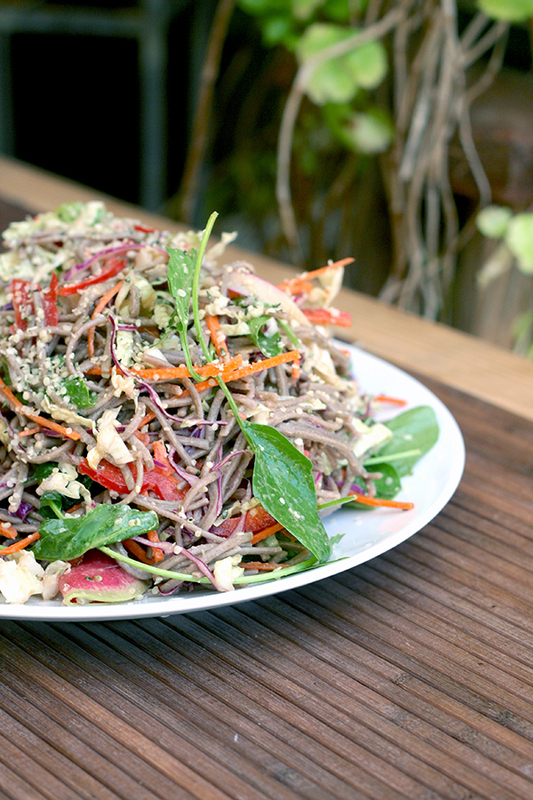 Toss together salad ingredients (watermelon radish, bell pepper, carrot, red and napa cabbage, and baby spinach) with soba noodles and dressing. 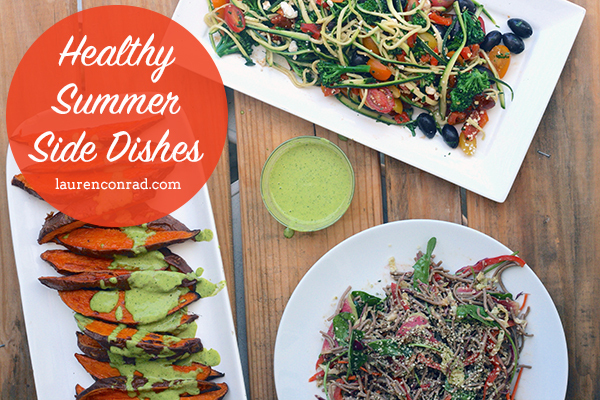 Garnish with hemp seeds and serve cold. How delicious do those look? Let us know which dish you are going to try first!